Was walking around Maastricht and saw this Area of nothing but bike. Changed from NEF to JPEG, sharpenned, cropped, shrunk to size. Great location, shot works really well. Oh my goodness! That's scary! Not necessarily an aesthetically pleasing image, but definitely interesting! wow. cool idea. i like the location of the subject, it makes it more interesting than if she were in the center of the photograph. Stunning! A little more sharpness would have made this perfect. And probably if the woman was more close to the center of the frame. feel there is to much there for your eyes to focus on anything, Idea is good. grat idea, just a little grainy. next time, try adjusting contrast. Almost like a Where's Waldo thing - nicely busy! In my opinion if you had followed the rule of thirds here it would have had the impact you were wishing for! Good idea anyway! Is this All Bikes in Rye, AZ? Sure looks like it. I can never figure out how Ron always knows just where everything is. I like the colors popping out of that jumble of metal. Interesting picture. OMG, this looks like a Police stolen bike yard. what a chaos! how in the world do you get anything out of this pile? i like the image. 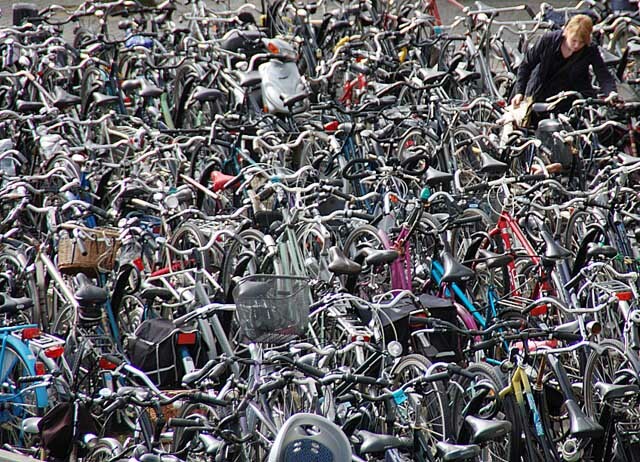 LOL ... it's like a "where's Waldo" scene with bikes!! I totally know how that goes! I like the idea...Bikes are everywhere! how in the heck does this work? 10 just for finding these,jeesh! Wow! That's a lot of bikes. Proudly hosted by Sargasso Networks. Current Server Time: 04/21/2019 12:57:49 PM EDT.